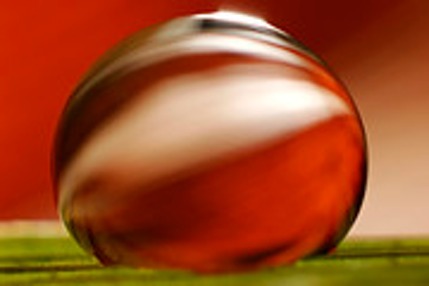 C Ribet Abstract Nature Photography subdomain is up. Mini slide shows of C Ribet Absract Color Photography and abstract photos for sale online are previewed selectively. More abstract nature photographs are also presented at ourlivingearth and abstract nature photography.com. during checkout on the 'Shipping' page to receive 20% off prints and products from the Planetary Alien Spaces Gallery. A C Ribet Mizzlescape or Dewscape (previously orbscapes) of plant leaves and water in close up view. 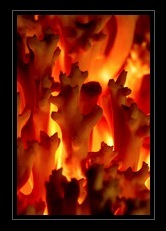 New fine art coupons and fine art promotional codes put up at c.ribet.gallerycalifonia.com Zenfolio gallery. Fine art promo codes can apply to your entire order (like a percentage discount for the entire order), give free shipping, or be for a dollar amount of relate to specific discount packages. 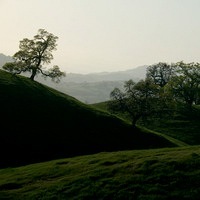 I've now put up the first selection of California oak tree pictures taken in Pacheco park, CA on an absolutely perfect day for capturing the hills receding into the mist. It took some hiking and enduring periodic rather cold rain, but was worth it as the conditions were perfect for capturing the hillsides fading away through the mists. I flatter myself to imagine that some of these works capture certain aspects of the artist Eyvind Earle's interpretations of the spirit of the California oaks and oak clad hills. I've been posting Sig Sauer P220 art which mostly mirrors the black and white metallic colors of the P220, but I have repeated requests for more color variety in the art prints. I can't paint the Sig pink, but I can provide colors as context based on the background to the gun. I've put up a couple of variations today. The photo for this blog entry is one bathed in red, and with a different perspective looking down the sights. The colors not only help with 'decor' for those to whom that matters, but also set the mood in a different way from the straight black and white images. At 6:30 pm Dr. Michael Link, Chief, Pediatric Hematology/Oncology will speak. 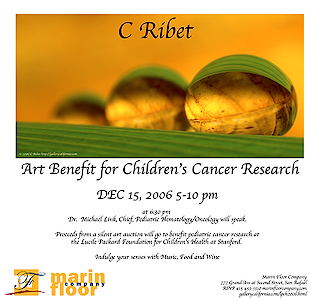 Proceeds from a silent art auction will go to benefit pediatric cancer research at the Lucile Packard Foundation for Children’s Health at Stanford. Thank you to all the local San Rafael businesses helping to promote the event - Kamikaze Sushi, Evolutions Home Furnishings, Ollini Furniture, Artizmo Gallery at the Northgate Mall and others too numerous to mention! Steve Mack of Framing Interiors of San Rafael has kindly agreed to be available at Friday's event to answer any and all questions about custom framing and matting and other presentation related questions you might have about how to present and prepare artwork for display. Steve has owned and operated his custom framing business for over 28 years and has an experienced eye for aesthetics which you'll be hard pressed to find elsewhere. As you have probably figured out now if you've looked at the events pages, we have decided to use The Yin and the Yang as the image for the show announcement posters and invitations. This keeps the wraps on the new works to be released at the show, and it's a great image which works well when printed on other media. We'll have show posters from previous events at the show as well. See you next year! Notes from the events page: The Sausalito Spring Faire is held the first weekend in May in beautiful downtown Sausalito. Our 36th Annual Faire will be held on the weekend of May 6th and 7th. Enjoy 100+ artists, fine food, wine, live music and a children's entertainment area featuring music, theater and activities just for kids! Admission to the Spring Faire is free. This family oriented Sausalito art festival benefits the Sausalito Nursery School. Thank you all for coming! Raffle and auction winners are being notified and can come by the gallery/showroom to pick up their pieces. We are finalizing the invitations and putting together the lists for mailed invitations. If you want to receive a mailed invitation, please use the RSVP form for the C Ribet Off the Wall Celebration. We'll preferentially notify be email (saves trees), but if you want a mailed invitation we'll be happy to send you one.